We have many banquet & event chairs to choose from: folding, stacking, & chiavari. The main feature of a "Banquet Chair" is being portable & easy to store. Folding chairs offer a lightweight & practical solution, while chiavari chairs offer elegance. Folding chairs will fold flat & stack, while chiavari & padded stacking chairs do not fold, but still stack. 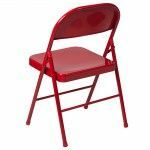 Of our 3 kinds of banquet chairs, folding chairs take up the least storage space per chair. Chiavari chairs take up the most storage space per chair.